What are some of the Product Benefits of Ultraguard Super Epoxy Swimming Pool Refinishing? 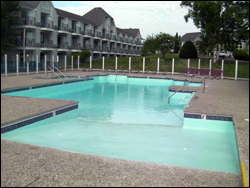 Ultraguard Super Epoxy Swimming Pool Refinishing is a long-lasting solution to concrete surface problems! It eliminates acid washing, painting and re-plastering for good. Super Epoxy by far outlives and outperforms all other swimming pool resurfacing methods including re-marciting, vinyl lining, pool paint, and fiberglass. Ultraguard Super Epoxy Swimming Pool Refinishing is an effective measure in combating cracks and pool leaks! Because the surface is a structurally strong, waterproof barrier, it prevents or covers unsightly surface cracks and reduces water loss through leaks. In turn, less chemicals and water need to be replaced. Ultraguard Super Epoxy Swimming Pool Refinishing reduces chemical consumption! Please refer to the warranty for specific details. Contact Super Epoxy to obtain a copy. Ultraguard Super Epoxy Swimming Pool Refinishing Offers high resistance against algae and stains! 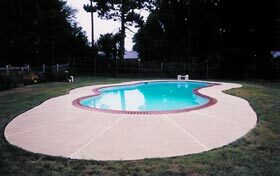 Because the surface is smooth and non-porous there is nowhere for algae to grip or for stains to penetrate. The easy-to-clean surface virtually puts an end to wire-brushing and scrubbing. Ultraguard Super Epoxy Swimming Pool Refinishing provides a non-abrasive surface! The smooth coating means fewer skinned elbows, scraped knees or snagged swimwear, so swimmers will love it. Who can compete with UltraGuard? Plaster, Paint and Fiberglass, Oh My! Why a Primer Bond Coat? Have you filled out our Questionairre?